IfNotNow seeks an American Jewish community that stands for freedom and dignity for all Israelis and Palestinians by ending its support for the occupation. It is building a vibrant and inclusive movement within the American Jewish community, across generations and organizational affiliations. IfNotNow’s strategy is inspired by a long legacy of social movements in this country — from the Labor Movement to the Civil Rights Movement to Occupy to Black Lives Matter — that have used nonviolent action to create urgency around moral crises and catalyze massive changes in the mainstream. While the out-of-touch establishment claims to speak for the American Jewish community, IfNotNow knows that American Jewry is eager for change. 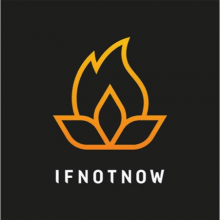 IfNotNow is bringing this crisis of conscience into full public view for our community. Through public action and imaginative ritual, it is demanding that the Jewish community take action in the struggle for mutual liberation. Join FMEP in supporting the work of IfNotNow by making a charitable contribution today.